The jobs gap that has of Zerohedg characterized the global economy since the crisis has cost some $1.2 trillion in lost wages and nearly $4 trillion in GDP. Employment growth worldwide has been just 1.4% since 2001, well below the 1.7% pace that prevailed prior to 2008. The result: there are 61 million fewer people employed globally than there would have been if pre-crisis trends had prevailed. In the eurozone, where unemployment stands at 11.3% and where some countries — Spain being a prime example — are struggling under unemployment rates that approximate what the US experienced during the Great Depression, the ECB has been forced to effectively abandon its “single mandate” of promoting price stability in favor of a stance that’s more in-line with the Fed’s dual mandate that encompasses both price stability and maximum employment. Ms. de Buyzer did not care that Candelia was a phantom operation. She lost her job as a secretary two years ago and has been unable to find steady work. Since January, though, she had woken up early every weekday, put on makeup and gotten ready to go the office. By 9 a.m. she arrives at the small office in a low-income neighborhood of Lille, where joblessness is among the highest in the country. While she doesn’t earn a paycheck, Ms. de Buyzer, 41, welcomes the regular routine. She hopes Candelia will lead to a real job, after countless searches and interviews that have gone nowhere. Yet long-term unemployment — the kind that Ms. de Buyzer and nearly 10 million others in the eurozone are experiencing — has become a defining reality. Last year, a staggering 52.6 percent of unemployed people in the eurozone were without work for a year or more, the highest on record, according to Eurostat, and many of those have been jobless more than two years. She looked at a stack of invoices, including some orders from virtual companies that had not been paid. “If this keeps up we’ll go out of business,”Mrs. Banuelos said, handing the papers to two women with instructions to follow up. “What’s our strategy to improve profitability?” she asked the group. They would be better of giving everybody a basic wage! Now that the Denis O’Brien’s murky dealings with the IBRC are in the spotlight, it has come to threat time. O’Brien is pulling out all of the stops to ensure that no one other than the people protecting him (KPMG, Dukes and of course the government) are equally protected. What O’Brien is trying to do is to not only destroy the last vestiges of democracy and free speech but his threats against Catherine Murphy is not leaned against her personally but it is a threat against us all. O’Brien signed away the right to have a say in anything that goes on in this country when he refused to pay his share of taxes and became a tax exile in order to avoid paying a red cent to the system that made him his billions and furthermore he signed away the right to be protected under the constitution when he made a very overt threat to the very constitution that he seeks to overturn. This government has waited hand and foot on O’Brien and protected him at every turn hence no recall of the Dail to what is arguably the biggest threat to our constitution since the inception of the state. So what is the next move for O’Brien? He has no recourse in the courts here as Catherine Murphy is covered by Dail privilege and no injunction can overturn that fact regardless of the threats and blustering coming from O’Brien. However he does have recourse to one area that he will be backed to the hilt (by the government) which is an appeal to the European Court of Human Rights. O’Brien will claim that his human rights as a citizen have been breached and it is likely that he may win that case as the ECHR is planted with politically appointed judges and then it’s game over for democracy in Ireland. Not only does O’Brien have a lot to lose if it doesn’t go his way but certain members of government also have a lot to lose because they are deeply embroiled in quagmire that was Anglo Irish Bank and subsequently the IBRC and that is why O’Brien cannot afford to lose this battle. The government’s job is to ensure that his “human rights” will be protected to the fullest extent and that your democratic and constitutional rights will be stamped into the ground. Just ask any anti water meter protesters who were arrested and dragged into the back of a Garda van how democratic that action by the state was ! Democracy in Ireland is at T junction in which the O’Brien juggernaut is coming from one direction and the government’s juggernaut is coming from the other direction leaving democracy with little choice but sit there in fear for its future existence. This scenario was foretold by people with vision who were laughed at and called conspiracy theorists, clowns and fools and now it is coming to pass and the laughing is about to stop when the result of this hits their freedom and rights only to find that none exist save what the state allows you to have. This is more than Denis O’Brien’s rights to use and abuse a system that he refuses to pay for… This is game over for Ireland if he gets his way ! GAZA CITY (Ma’an) — Activists in Gaza City on Sunday marked five years since Israel’s deadly attack on the first Freedom Flotilla in 2010, a day after the ship leading Freedom Flotilla III arrived in the port of Bueu in Spain en route to Gaza.Israeli naval forces killed nine activists On May 31, 2010 after they stormed six ships intending to break the Israeli blockade of Gaza.The incident took place in international waters and sparked international outcry.Sunday’s commemoration ceremony was organized by Miles of Smiles, an international Gaza aid campaign, and was attended by dozens of activists.The participants held up photos of the victims of the first flotilla and chanted slogans demanding freedom for Gaza and Palestine.They then sailed a short distance off the coast and threw roses into the water in honor of the victims, also raising the flags of the countries participating in the current flotilla.In a press conference in Gaza port, a spokesperson for Miles of Smiles, Ali al-Nazli, said the commemoration was part of ongoing efforts to end the blockade of Gaza.”We are here to say to Marmara martyrs,” he said, referring to the Turkish ship aboard which the activists were killed, “we won’t forget you…and history won’t forget you.”He also applauded the president of Miles of Smiles, Issam Yousuf, “who has been touring the capitals of the world to recruit support for Gaza and Palestine.”A trawler leading the third Freedom Flotilla arrived in Spain on Saturday after setting sail from Sweden earlier this month.The ship, called the Marianne, will join other ships heading to Gaza in “a peaceful, nonviolent action to break the illegal and inhumane blockade of the Gaza Strip,” according to the Freedom Flotilla Coalition.The Marianne is carrying a limited cargo of solar cell panels and medical equipment for the devastated Gaza Strip.It will carry a crew of five people as well as “up to eight delegates as passengers in each section of the route,” the FFC said, with these delegates to be announced along the way.European MEP Ana Maria Miranda Paz will be one of the passengers when the boat leaves Bueu for Portugal, with a range of other public figures expected to participate in the flotilla, including former Tunisian President and human rights activist Muncef al-Marzouk.Gaza has been under a crippling Israeli-administered military blockade since 2007. 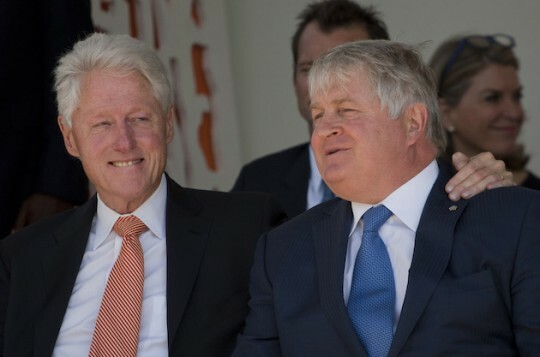 Irish billionaire and Bill Clinton crony Denis O’Brien is under fire in his home country (although he technically resides in Malta for tax purposes) over an alleged sweetheart loan deal with the publicly-owned Irish Bank Resolution Corporation (IBRC). The controversy erupted after Catherine Murphy, an independent members of the Irish parliament, discussed some details of the loan arrangement, which involved a “verbal agreement” with former IBRC chief executive Mike Aynsley and an unusually low interest rate, in a speech to members on May 6. Two weeks later, Ireland’s state-owned broadcaster, RTÉ, was preparing to publish a story outlining the terms of O’Briens loan agreement in greater detail, but were prevented from doing so after O’Brien won a court injunction, citing the need to protect confidential financial information. For this reason, few Irish media outlets reported on remarks Murphy made on Friday in another speech to Parliament, outlining the loan agreement in more detail. Because IBRC is owned by the state, Murphy argued, the terms of the loan were a matter of public interest. O’Brien was reportedly paying an extraordinarily low rate of 1.25 percent, well short of the standard commercial lending rate of 7.5 percent. A story posted on the RTÉ website Friday contained the following disclaimer: “RTÉ is legally restricted from reporting what [Murphy] said, because to do so would breach the injunction already granted against it.” O’Brien’s lawyers, meanwhile, have argued that the injunction pertains to all Irish media outlets, some of which happen to be owned by O’Brien (and have yet to cover the story). In recent years, O’Brien has developed a close personal friendship—and profitable business relationship—with former President Bill Clinton. O’Brien has organized a number of speaking gigs for the former president, including a September 2010 event in Dublin after which O’Brien donated as much as $10 million to the Clinton Foundation. Several week later, Clinton received $225,000 for speech hosted by O’Brien’s telecom conglomerate, the Digital Group. This was around the same time that Digicel was applying for lucrative State Department grants to provide mobile payment services in earthquake-ravaged Haiti. Digicel would ultimately be awarded millions in U.S. taxpayer funds for its work in Haiti, which would help Digicel capture nearly 80 percent of the Haitian mobile phone market, making it the company’s most profitable network. Most recently, O’Brien partnered with Bill Clinton and the Clinton Foundation to build a luxury Marriott hotel in Port-au-Prince. Reports suggest that workers involved in the hotel’s construction were paid significantly less than advertised. Just something to keep in mind whenever the Clintons’ defend their foundation by citing the “good work” they do in places like Haiti. O’Brien is no stranger to allegations of corruption. In 2011, following a 14-year investigation into political corruption, an Irish judge accused O’Brien and former a communications minister of colluding in the mid-1990s to help O’Brien secure lucrative mobile phone contracts that would help him launch his communications empire. The investigation found evidence that the communications minister, Michael Lowry, had provided O’Brien with privileged information, and had engaged in “irregular interactions with interested parties at [the] most sensitive stages” of the government’s deliberation. O’Brien, who was found to have funneled at least $170,000 to Lowry via “clandestine” transactions, denied any wronging and was never charged with a crime. Herded up like cattle and led away onto Indonesian army trucks to be tortured and then murdered. This is the reality of life in occupied West Papua. A land where over 500,000 people have been murdered by the Indonesian army, and thousands more have ‘disappeared’, been raped, tortured and imprisoned. Something very strange going on! Are the Irish public asleep?? ?